The more piles knick knacks and piles of odds and ends laying around your house, the more surfaces there are for dust to collect on. Keep your floors and furniture as clear as possible, and you’ll notice a huge decrease in the amount of dust in your home. As soft and luxurious as carpet can be, it’s also a perfect haven for dust to collect in between fibers, and even a good vacuuming isn’t always enough to get rid of it all. Laminate, hardwood, or even tiling is much easier to keep under control when it comes to dusting. Just sweep regularly, give it a thorough cleaning with a dust mop once a week or so, and you’ll be good to go. Dust has to come from somewhere, right? Open doors and windows are the biggest offenders. Keep them closed whenever possible, and invest in some good screens to keep the tiny particles at bay. Dust-mites love to hide amongst your blankets and sheets. Keep them at bay by washing your bedding once a week. For even more protection, invest in a mattress cover. Next time you’re cleaning your house, start at the highest surface. 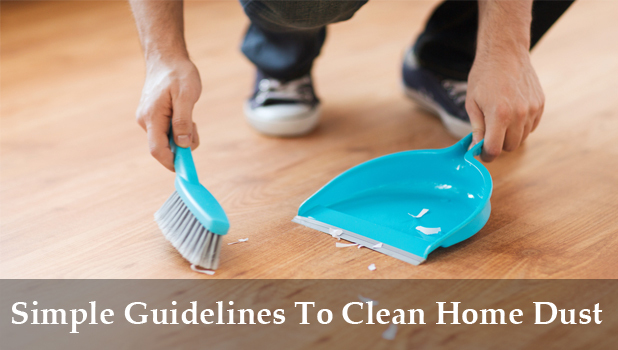 This way, you’ll be sure to catch all of the dust and dirt that falls as you clean. Instead of throwing piles of clothes and paper straight into the closet, store them in airtight containers or plastic bags to prevent dust build-up. If you suffer from asthma, allergies, or are just particularly sensitive to dust, then you may want to invest in an air purifier which will actually filter airborne dust particles. Unfortunately, a purifier won’t take care of dust that’s already settled, or dust mites though. What’s more, for an air purifier to be truly effective, you’ll want to have one in all of your major rooms. It can be expensive, but for the reassurance and ease of getting rid of dust, it’s very worth it!